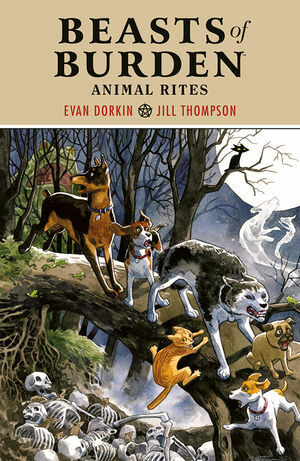 Dark Horse Comics’ Beasts of Burden: Animal Rites Lands on May 9th! If Evan Dorkin and Jill Thompson‘s Beasts of Burden ever finally becomes a movie, I will be there opening night. This writer and artist team crafted a wonderful world where animals, not people, investigate the supernatural! The reasoning is very sound; animals have senses humans do not to perceive paranormal goings-on. This treatment should have materialized by now; news broke back in 2013 and has since been in development hell. In the interim, Dark Horse Comics release of new works is equally sporadic, mostly due to the team having busy independent schedules. This team first appeared in The Dark Horse Book of Hauntings (2003) , and it has accumulated to Animal Rites (Amazon Link) , to be reprinted as a trade paperback on May 9th, 2018 — a perfect jumping in point for newcomers — and Wise Dogs and Eldritch Men, all-new tales on August 22, 2018.